Having the time to finish the front and back of Cherie and start on the sleeves. Waking up at 8:30am instead of 6:30am. 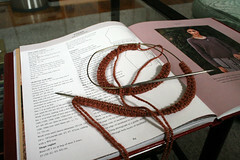 Enjoying a few more hours to hang out at your LYS and to talk about exciting new happenings on the horizon! Being able to blog more often and with energy which leads to meeting new people and getting a few surprises. Thanks again Mai!!! Getting time to truly assess the stash and feeling good about going to School Products and walking out without any new yarn. A round trip to the Jersey shore to find a house to rent for the summer. Meeting my dad for lunch in the city and walking around 5th Ave. with the handsomest man I know. Stalking Bloglines 24/7 to see some great looking Le’Slouch’s that make me want to cast on for one like now. Having the time to make pancakes for me and my BF not once but twice this week. I’m an excellent flipper. Getting a call from my mom at 8:30am to help her figure out how to purl and knowing that she’s knitting with the women at her office! My day job isn’t the most glamorous nor does it pay the big bucks but these are the things that make it the best job in the world. Who knows, the way the weather is shaping up tonight maybe I’ll squeeze just One More Day… I’ll be sleeping with my pajamas on inside out tonight. ETA: That pajama thing works every time! Woo hoo! i heart snow! oh that sounds like an absolutely lovely break. isn’t mj trimmings great? what a luxury to spend a day finding the perfect buttons. I’m glad you had such a great week off! I’m looking forward to seeing your Cherie sweater done. my boyfriend is from the jersey shore. i used to make the four-hour drive from virginia to jersey to visit him quite often. i miss it! where specifically did you go to look at houses? i know of a FANTASTIC pizza place (seriously the best pizza i’ve ever had. we drive up to jersey just for the pizza sometimes.) you have to go to if you’re nearby! ahhh – that sounds wonderful, relaxing and rejuvinating! I wish I got a spring break! !